Most readers must be very familiar with this white fleshy fruit. It's sweet and refreshing to make Jicama become the target of many people when thirst and heat during the day. This fruit can be consumed directly, made rujak, or made into pickled depending on taste. The fruits belonging to the legumes are from Tropical America and there he is better known as jicama or xicama. While in the area of ​​Java better known by the name besusu. This fruit has long been known for its benefits for health and beauty. It is supported by a variety of vitamins, minerals, and other essential nutrients such as vitamins A, B1, C, K, E, iron, manganese, magnesium, potassium, calcium, copper, and phosphorus. If you are diabetic or are on a diet program do not have to worry about eating this fruit because the sweetness it has derived from inulin which belongs to the oligosaccharide group that can not be digested by the body so as not to add calories in the body. So far we know Jicama as one type of fruit is very good for skin beauty both face and body. Various beauty products such as masks, scrubs, facial moisturizers, face creams, and so on using Jicama as the basic ingredients of manufacture. But it turns out there are so many other health benefits that can be obtained from the fruit that has this latin name pachyrhizus erosus. One of them for gastric health. Various content of vitamins, minerals, and other essential nutrients possessed by Jicama can help maintain stomach health and overcome various stomach diseases. As one of the important organs in the digestive system of stomach health must be maintained. Because disturbances in the stomach can cause disruption also in the digestive system. As a storage and digestion of stomach food located between the esophagus and the small intestine will accommodate the food we eat and then digest it. In the stomach occurs the release of stomach acid as the body's first defense against bacteria that still exist in food. Stomach acid also helps membantuk break down the components in the food so much softer and more easily digested. Here are some benefits of eating bengkoang that we can feel especially for gastric health. Undoubtedly fiber is one of the nutrients needed by the body especially for digestive health. Unhealthy lifestyles make many people eat foods that are less fiber so they often suffer from various diseases such as obesity, constipation, indigestion, and so forth. For it is important for us to consume a variety of fruit and vegetables one of them Jicama. 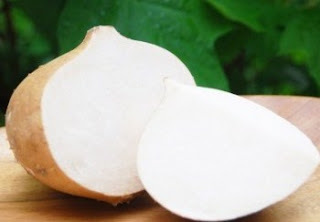 By consuming Jicama in adequate portion of our body will get the required fiber intake. With sufficient intake of fiber there are various benefits that we can feel such as make us feel full faster so as to prevent excessive food consumption, stabilize blood sugar levels, prevent diseases that attack blood vessels and heart disease, reduce the risk of diabetes, and reduce the risk of exposure Bowel cancer. With high fiber content consuming Jicama can help digestion so that what we eat can be processed, absorbed, and the rest is completely removed. To maximize the benefits obtained should Jicama consumed directly. Even if made rujak spice used is not too sharp because it can interfere with digestion. Other benefits that can be obtained from eating Jicama is to prevent constipation or difficult bowel movements. Although impressed trivial but this condition is quite disturbing comfort and make the sufferer feel pain. If left constantly is not good for health. With high fiber content in Jicama can help soften the stool so it is easier to move in the digestive tract and more easily removed. Jicama can be made snack and interspersed with other fruits. This is certainly healthier than eating snacks in the form of fast food that is not only minimal fiber but also contains a lot of flavoring and preservatives. As mentioned earlier, stomach acid is one type of liquid produced by the stomach. Stomach acid is needed in the process of digestion of food. However, if the levels of stomach acid produced are not normal, whether lower or higher than required, will cause disruption to the body. As if the levels of stomach acid produced excessive resulting in the name of stomach acid rose which then spread to the lungs and can lead to hypotension. To overcome this problem is recommended to consume Jicama. Its alkaline properties are excellent for absorbing stomach acids thereby reducing perceived pain. As the name suggests this disease is a form of inflammation that occurs in the stomach lining, causing the sufferer to feel pain in the upper abdomen, vomiting, and bloating. The occurrence of this inflammation is usually caused by the consumption of foods that are too acid or too spicy excessive, certain bacterial infections, stress, or side effects of drugs consumed. This disease results in the production of stomach acid and pepsin become disturbed and not normal. Stomach acid increases, and the mucous membranes that protect the thinning wall of the stomach. If left constantly and the cause is not reduced, it can cause ulcers or sores on the stomach wall. This disease can also be overcome by eating Jicama . Can by consuming it directly can also be made juice. Maag is known as a very common disease suffered by many people. What distinguishes it is only level, there is a light, medium, and heavy. This disease is usually caused by the habit of procrastinating mealtimes, eating too much, eating in a hurry, oily foods too much, consuming too much alcohol, or eating foods that are too acid or spicy. To overcome this disease you can take advantage of Jicama. The trick with drinking water juice Jicama that has been given a little salt twice a day ie morning and afternoon on a regular basis. Can also consume Jicama juice plus honey and water. Very useful is not it? So what are you waiting for? Starting from now enter Jicama into your daily menu in addition to a variety of fruits and other vegetables so healthy stomach and protected from various diseases.